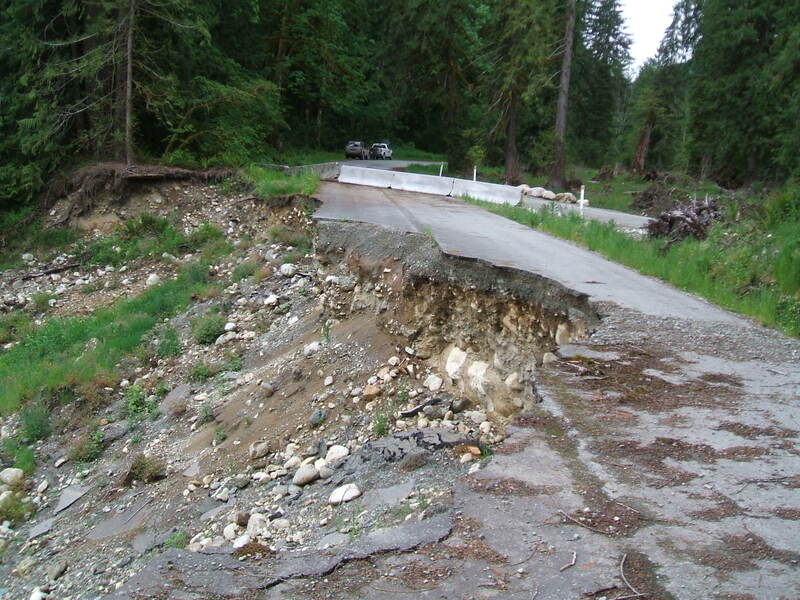 In November 2006, flooding of the Suiattle River caused significant damage to Forest Service Road FR-26. The existing road was washed out in numerous areas due to erosion and slope instability. SK Geotechnical is currently providing preliminary geotechnical services along three portions of the alignment: MP 6.0, MP 12.6 to 13.5, and MP 20.8. A realignment of the roadway is being considered for the MP 6.0 area. Geotechnical services along this portion of the alignment have included shallow test holes and hand auger borings to provide pavement and gravel surfacing section thicknesses recommendations for the realignment. This area also crosses a marshy area, and subgrade stabilization with geosynthetic recommendations are also being provided. Realignment is also being considered for the MP 12.6 to 13.5 portion of the roadway. Fairly detailed geotechnical observations have been performed along this portion of the alignment. This realignment area crosses several old existing landslides uphill and below the proposed roadway. Geotechnical recommendations related to the new roadway alignment to avoid cutting at the toe of these landslides or filling at the crests are being provided. The MP 20.8 area represents a portion of the alignment crossing an existing landslide directly adjacent to the Suiattle River. At this time, it is anticipated that fairly detailed geotechnical evaluation of this portion of the alignment may be performed. Geotechnical recommendations are needed to evaluate the best options for this portion of the road, such as moving the road deeper into the slope, which would require landslide stabilization, or rebuilding the road along the old alignment, which would require rock buttressing and reinforced embankments.